"Who cares about Cannes?" Oh this is fun. 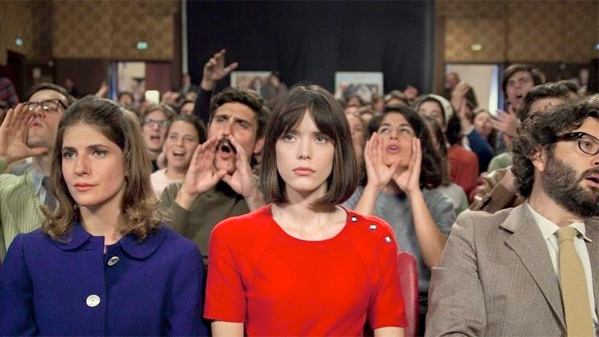 Indiewire recently debuted the first US teaser trailer for the film Redoubtable, the latest feature from prominent French filmmaker Michel Hazanavicius (of The Artist, The Search). The film tells the story of the 1960s love affair between iconic filmmaker Jean-Luc Godard and 17-year-old actress Anne Wiazemsky. It takes place during the making of and release of Godard's film La Chinoise, from 1967 to 1968. Featuring Louis Garrel as Godard and Stacy Martin (from Lars von Trier's Nymphomaniac) as Wiazemsky. Also featuring Bérénice Bejo and Grégory Gadebois. This is a hilarious trailer mocking Cannes, because Redoubtable is playing at the Cannes Film Festival this year. It gave me a good laugh. We posted another teaser a month ago. Stay tuned for more news after it premieres this month.